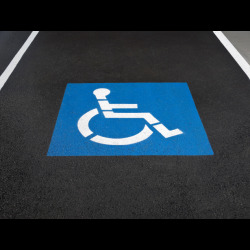 Blackfriar Line Marking Spray for car parks, factories, sports fields, sports courts, building sites and more. 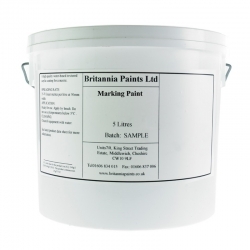 Blackfriar Line Marking Spray for car parks, factories, sports fields, sports courts, building sites and more. Interior and exterior use. Could this be used to mark out a badminton court on the lawn? Would it mark the grass well enough, would it damage the grass and how long might it last (obviously as long as the grass doesn't grow too much and need cutting)? Line marking machines appear too expensive for recreational use. The solvents in the Blackfriar Line Marking Sprays are quite strong and are likely to kill the grass. There are more specific products for grass which wear off quicker but are less harmful to the grass, these will be a safer option. 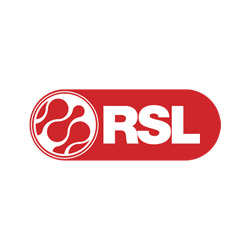 Rust-Oleum 2800 Ground Marking Aerosol and Rust-Oleum Hard Hat 2300 Marking Aerosols both specifically state they can be applied to grass but we wouldn't be able to advise on how long they would last. Can I use this spray paint to repaint the lines of a badminton court on a church hall wooden floor. Thank you. 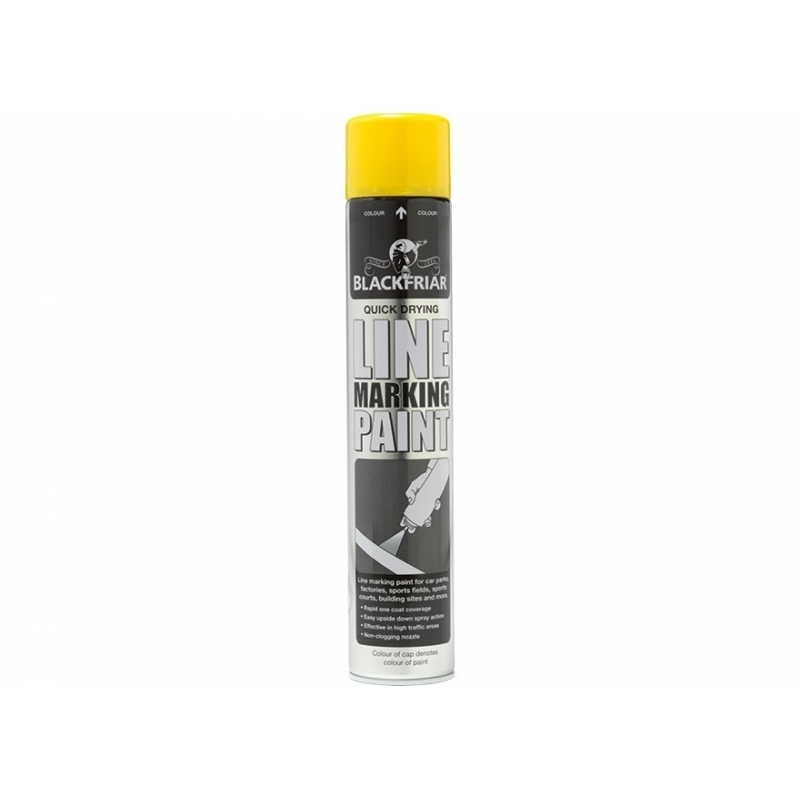 Blackfriar Line Marking Spray is suitable for marking out the lines on a previously painted/varnished wooden sports court. Test compatibility with the existing coating, especially if it is freshly applied, on a small inconspicuous area prior to full application. 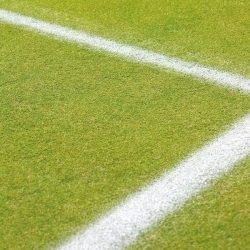 This is a permanent line marking paint, recoating on a regular basis may be required in high wear areas. Question: Is it semi perm paint? 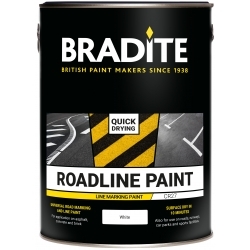 Blackfriar Line Marking Spray is intended to be permanent but the longevity of the application will depend on the substrate it is applied to and the preparation carried out. 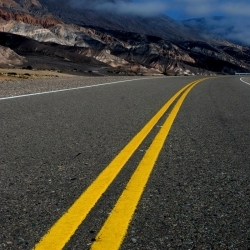 An easy to apply, preformed thermoplastic road and surface marking material. 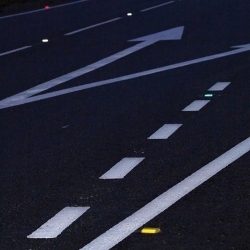 Ideal for fast permanent installation or re-instatement of road markings, car park markings and cycleways. 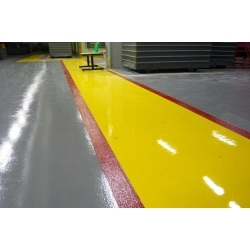 A quick drying, long-lasting marking paint for bare concrete, asphalt and painted floors. Ideal for factories, schools, car parks and public areas. 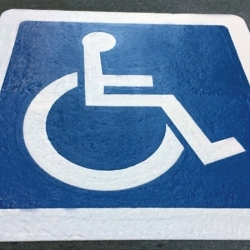 Rust-Oleum Stencils are heavy-duty, re-usable letters, numbers and symbols for floor and general marking in warehouses, parking spaces, roads and more. They can be used with all paints, applied with brush or roller and aerosols and are easy to clean. 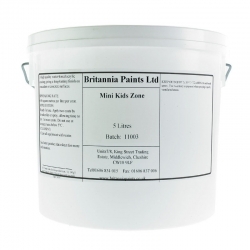 This excellent slip-resistance paint has been specifically designed for the young budding Tim Henman's, with specific focus on enhancing youngsters' enjoyment of tennis. Advantages 3 Slip resistant rich colours. Matt finish. Water-based acrylic coating. Eco-friendly. 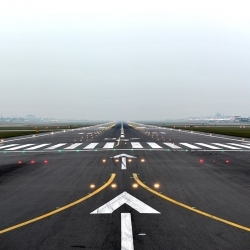 Cataphos FS01 Acrylic is a durable, aromatic free chemical resistant traffic and airport marking paint which is suitable for use on both asphalt, concrete, aged blacktop, thermoplastic coverings, block paving, some wooden floors and most types of painted lines. Ennis-Flint Cataphos Waterbased EP Paint is a user friendly, high solids, fast drying traffic paint formulated specifically for airless equipment and conventional air atomized equipment used in painting roadways, airports, car parks and smaller lane line striping equipment with or without the addition of glass beads for reflectivity and skid resistance. 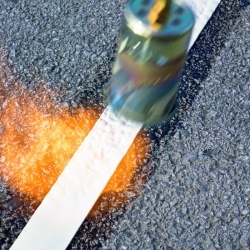 An easy to apply, preformed thermoplastic road and surface marking material. 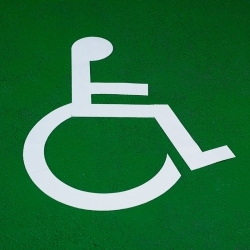 Ideal for fast permanent installation or re-instatement of&nbsp;symbols, letters and numbers. 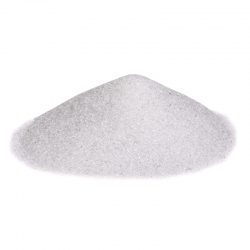 A specially produced ground glass aggregate to be broadcast/sprinkled by hand in to the thermoplastic material immediately after heating. 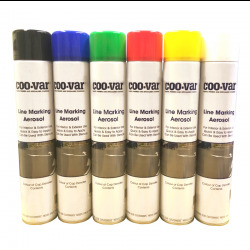 A durable and long-lasting marking paint available in an assortment of rich and aesthetically-pleasing colours, for use on cycle lanes or pedestrian walkways. The eco-friendly solution allows for both internal and external use. Possible Uses Driveways. Pedestrian areas and walkways. Cycle routes and paths. Indoor flooring and walkways.